Calaméo - Professional Culinary Career - Why is a Chef Famous? Professional Culinary Career - Why is a Chef Famous? The 1st professional culinary celebrity to seem on TV was probably American Julia Child. 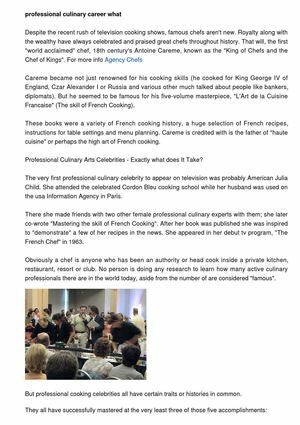 She attended the celebrated Cordon Bleu cooking school while her husband was assigned to the US Information Agency in Paris.